Starting on Thursday, March 1st, the women's international teams ranked 1st, 2nd, 3rd and 6th by FIFA will face off against one another in the 3rd SheBelieves Cup. The United States, Germany, England and France will all have an eye towards a somewhat more important tournament next summer, and consequently I expect a better showing all around than what we witnessed a year ago. 4 of the best teams in the world. 3 amazing cities. Only 1 winner. Bring it on. La liste de Corinne Diacre pour le tournoi international "SheBelieves Cup"
Each team has been up against some adversity and/or controversy coming into 2018. 2017 doesn't seem so long ago, but your 2018 squad won't look anything like this! For the Americans, the squad seems fairly well sorted. The only real doubts (other than doubts about the team's coach from a vocal subset of fans) are some lingering injury concerns, especially with two of the more exciting, creative players in the pool in Tobin Heath and Rose Lavelle. Neither are on the roster for this tournament. Becky Sauerbrunn is another notable missing face, though she's never been a long-term concern for injury reasons. Lavelle and Heath missed almost the entire 2017 NWSL season due to injury, and the extended duration of their recovery has to cause Ellis a bit of pause each time she narrows down her lists. A year ago, nobody would have expected these two to be questionable roster inclusions. What about this time next year? Time will tell. When healthy, both are nearly irreplaceable talents with the ability to change any game in the blink of an eye. Even Steffi Jones was cold last year. 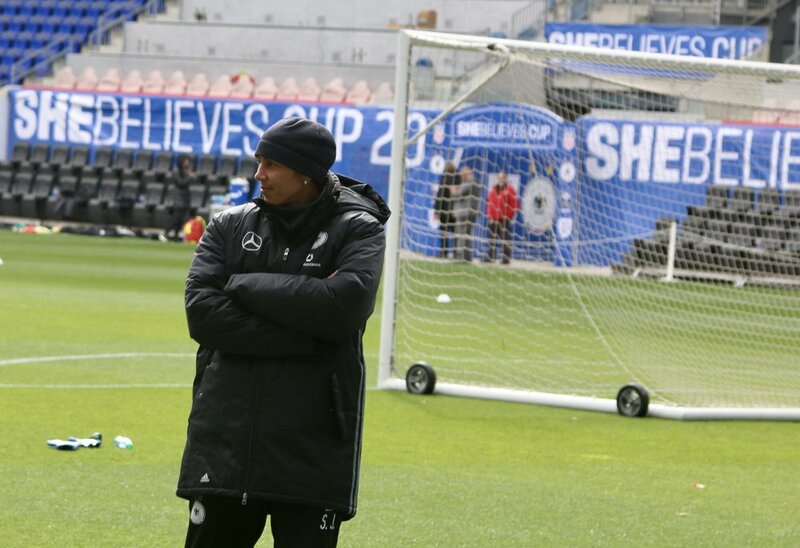 Germany arrived to last year's tournament in a transition phase, with a new manager in Steffi Jones. Her results early on were not exactly inspirational, but she's compiled a 13-3-3 record without any major tournament victories and a tepid quarterfinal bow-out at the hands of Denmark in last summer's UEFA Women's Euro. Still, the squad has been sufficiently consistent to rise again to the #2 FIFA ranking, so all hope is not lost. Most of the women on the team are in mid-season form and are fairly healthy. I'd expect they'll be looking to win this year's installment as they build towards the 2019 WWC. Hey look, Rachel Daly is a Lioness after all! England. Oh, where to begin? There's a new boss here too, but for quite a different reason. If you don't want to throw up in your mouth a few times, maybe skip reading up on all the gross details on Mark Sampson's sacking and the FA's process to replace him. In place now is Phil Neville, assisted by the newly retired Liverpool Ladies icon, Casey Stoney. There was so much to like about the play of this squad last year, but like the Germans, they too were found wanting in their pursuit of UEFA Women's Euro glory last summer—crashing out 0-3 in the semi-finals to the eventual champions Netherlands. This time, they'll be without Captain Steph Houghton, Caren Karney and the extremely valuable Jordan Nobbs. Lucy Bronze will wear the captain's armband for the Lionesses as they look to do better than their customary 3rd in this tournament. Don't be surprised when Sarah takes up this position and makes the save anyway. France. Let's get this out of the way: Bouhaddi gonna Bouhaddi. But you really wouldn't want it any other way. At some point in this tournament, you'll be scratching your head as the Lyon GK gets herself profoundly out of position to concede a bad goal. But then, she'll almost certainly make a few saves that more than compensate. I love watching her play, and so should you. Corinne Diacre's young squad won't feature Wendie Renard, who is recovering from an ankle injury. That's a huge loss in both leadership and physical presence. She's arguably the most important woman in the squad—a positive wall in the back and a serious threat in the air on attacking set pieces. Still, former Portland Thorn Amandine Henry can control the midfield and find Eugenie Le Sommer to create scoring chances. Le Sommer will have to get it done, because the rest of the forwards aren't exactly household names outside of their home country. Diacre will need someone new to step up and deliver if France is to mount a challenge to their top class opponents. Your friendly correspondent will not be attending any of the SheBelieves matches this year, as a long-overdue vacation is in order. However, in the spirit of SheBelieves, I've secured the photography skills of @adb.photos for the matches in Harrison, NJ. She's a talented young woman, and she'll be taking over the Her Pitch Instagram account for the day, so make sure to have all of your screens available on Sunday for lots of great stuff from Anya. Don't forget to follow her accounts as well! These are almost certainly wrong, so plan accordingly. That would give us the USA to win, with Germany, England and France not winning, in that order. So, everyone should expect France to dominate. No, I just can't see it. Sorry, France.